To take the Hōkūle‘a for a spin off the coast of Oahu is to see the Hawaiian islands in perhaps the same way as their discoverers did many hundreds of years ago. Those Polynesian seafarers likely arrived on a boat resembling the double-hulled canoe, bridged by a modest deck, compelled by three sails and steered by a rudder, its components held fast with ropes rather than screws or nails. The 62-foot vessel left Hawaii on May 30 on its longest-ever ocean voyage. 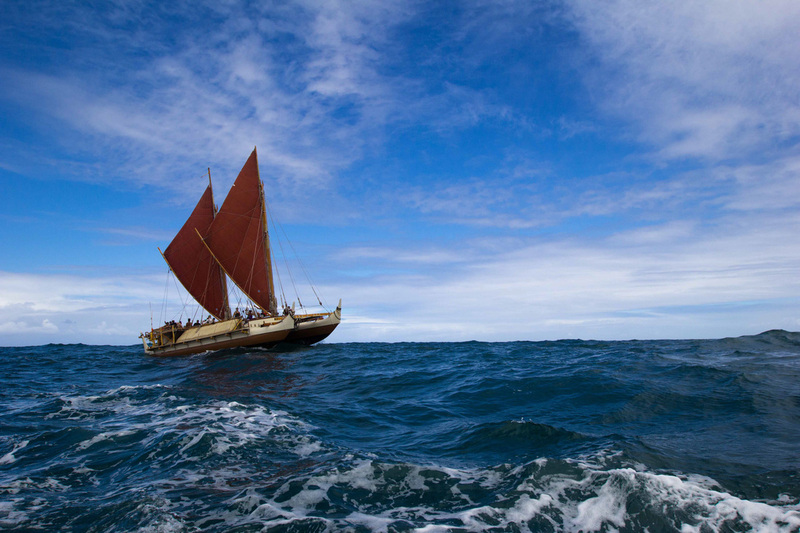 Relying on wind and stars to guide it, the Hōkūle‘a will chase the horizon for 47,000 miles, dropping anchor at 85 ports on six continents. The three-year tour—roughly south and west from Hawaii past Australia, around the Cape of Good Hope, to the Americas, and back via the Panama Canal—will make the Hōkūle‘a’s watershed first voyage in 1976 look like a light jog. That round trip to Tahiti demonstrated, for the first time in centuries, the efficacy of ancient Polynesian way-finding and boat design. The canoe became an immediate icon amid an ongoing renaissance in Native Hawaiian language and culture. The boat’s first navigator, Pius “Mau” Piailug, was among the last half-dozen people in the world to practice the art of traditional navigation when he agreed to teach the Hōkūle‘a’s crew. This latest voyage—called Malama Honua, or “To Care for Our Earth”—seeks to bring awareness of the earth’s beauty and our interconnectedness to ports around the planet. The trip will also help train the next generation of young navigators to propagate the craft. “You go through the oral history and you understand all the processes and concepts about it, but when you see a voyaging canoe for the very first time manifested in reality in front of your eyes? Man, that’s incredibly powerful,” said Baybayan, who first beheld the boat at 19 in 1975. “I used to spend hours on the beach just watching her float at anchor. It was just that strong a magnet for me. And it wasn’t just for me. It was the same way for a lot of Hawaiians,” he said. The canoe is being escorted by a modern 72-foot sister vessel called Hikianalia. A flotilla of gadgetry aboard that boat will connect the voyage to classrooms via satellite uplink, giving students throughout Hawaii and around the world a chance to see math and science in action. Crew members will perform experiments and gather data throughout the trip to fuel projects and discussions around ocean health, marine animals and sustainable living. “What I think she can do, in a very quiet way, is bring the idea that we are all indigenous to this earth, and we all have that ocean memory,” said Jenna Ishii, one of the apprentice navigators who will take shifts during various legs of the voyage. Those months at sea promise to be an epic adventure—if also damp, cold, itchy, salty and nauseating, Jenna said.